Words have never been my means of communication. When there was something to be said, my voice was my art. For more than sixty years every thought, mood or impression has been laid down on paper. The medium I use varies with my mood or inspiration, but most times I choose the pencil, I love black and white: to me it is the richest form of color. 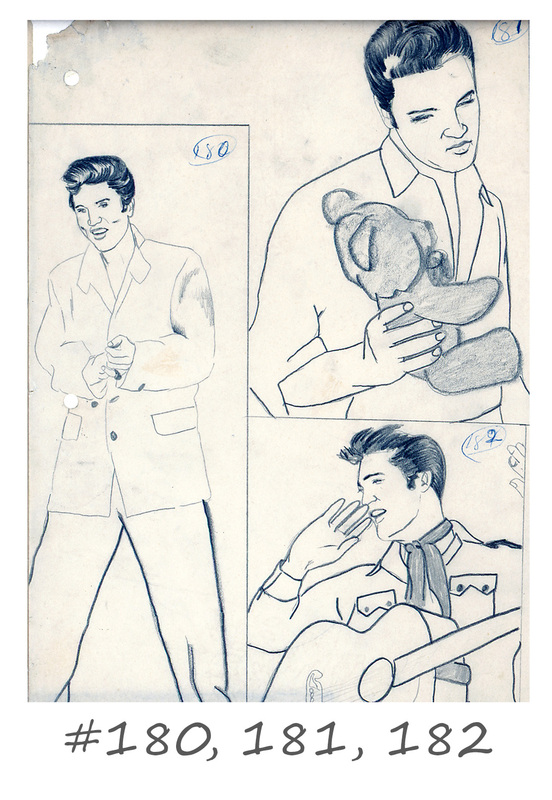 I have drawn countless subjects, but I always return to Elvis. We have merged into one for the purpose of communicating feelings. What might have at one time been artist and subject has long since fused into one existence for the purpose of art and expression. 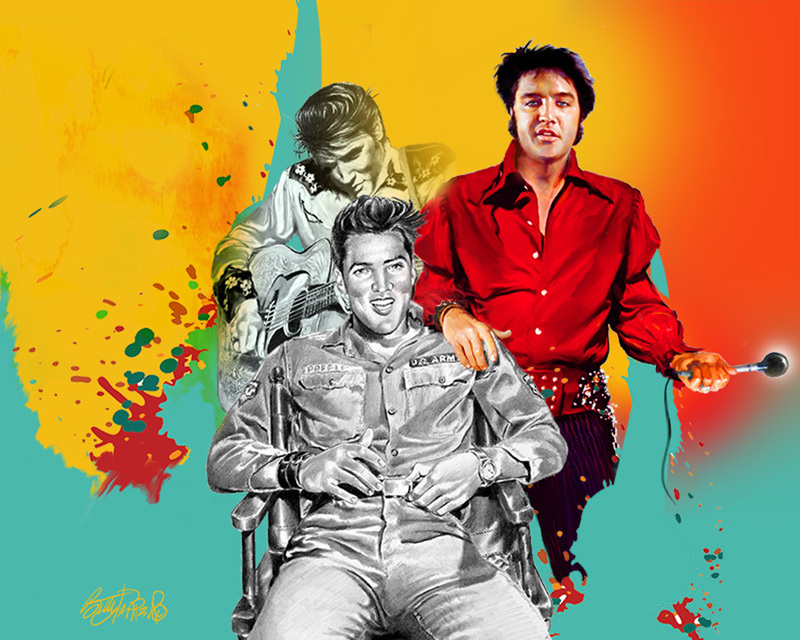 Elvis has been so much a part of my artwork and life. Where does it begin? 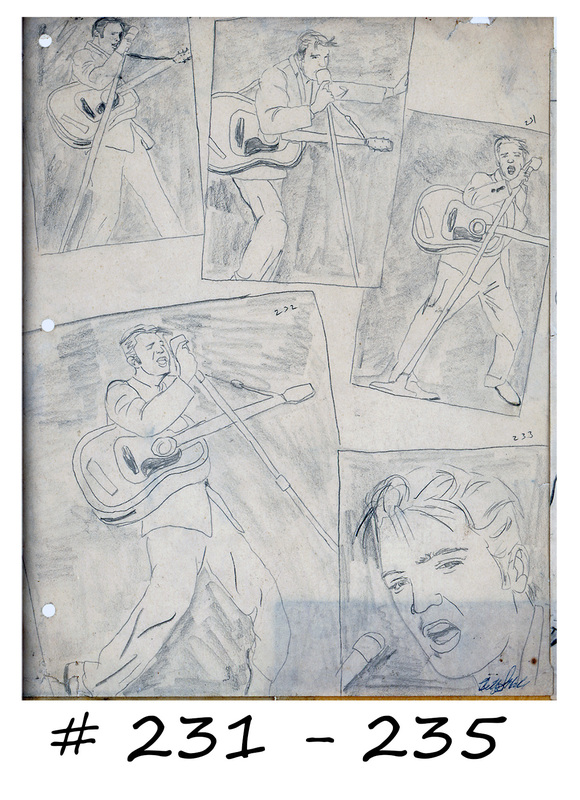 I was nine when Elvis appeared on the Tommy & Jimmy Dorsey Stage Show, a production created by Jackie Gleason to broadcast before his own program. It was an OK show, not great, but served the purpose for which it was created, yet on the night of January 28, 1956, it would become a part of history. Sitting in my living room with my parents, glued to the television, I was fortunate to have been able to experience it. When Elvis had finished my dad said, “that boy is going to make a million dollars”. In the 1950s that was a fortune, only to dream about. My good fortune lay in the fact that not only I, but also my parents liked Elvis. They thought he was great. I had already developed my interest in drawing but had not turned that interest into drawing people, yet. One day a classmate asked me if I had ever tried to draw a real person and that got me to thinking: Why not? I had been drawing everything else around me. The first person I tried was Roy Rogers, who was on the cover of the “Big Chief” tablet I used for school. 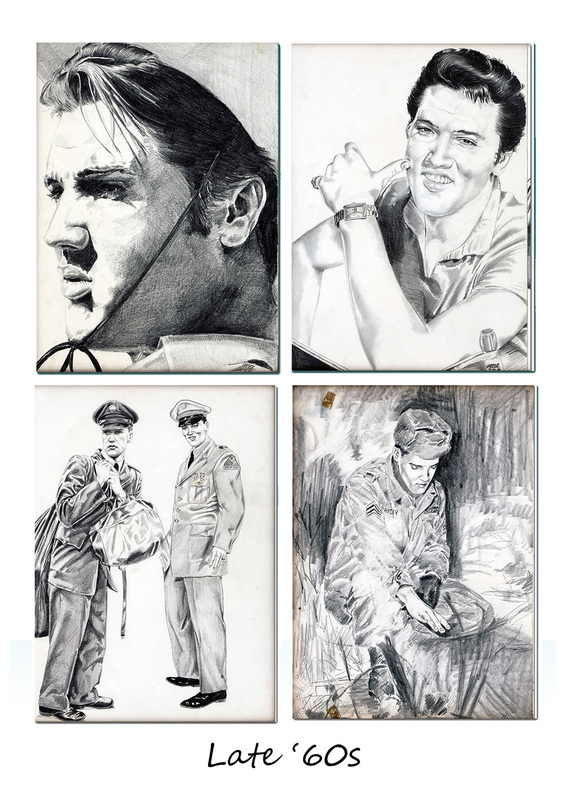 Well I was on my way and Elvis was definitely at the top of the subject list for my pencil and any other medium I could think of to create his image. 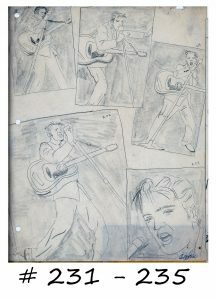 Picking up a pencil to do my first drawing unleashed a passion for creating, and Elvis has always been an important factor in the development of my art. Now, more than sixty years later, I stand at a landmark in my career: completion of my 20,001 rendering of Elvis, titled, “Me, Myself & I”. Through the years the most drawings of Elvis I have done in one day was eleven, and that was early on as I had yet to develop detail, shading, and a style. When the position this drawing would hold in my career became evident, it seemed fitting to incorporate a variety of techniques with which I have experimented. I have gone from using #2 pencils we had for school to being able to create art on a computer. Along the way I have used oils, acrylic, pastel, charcoal, ink, sharpies, color pencils, rice….and the list goes on. The drawing, number 20,001, incorporates a number of these mediums, on heavy art paper and unframed measures, 20” x 24”. The art is matted and in protective plastic. So now what to do with “Me, Myself & I”, number 20,001. After much thinking and discussions with the family, I have decided to use the art to give back. When my daughter, Bridget, passed away last year we established the Bridget Chérie Harper Artist Scholarship Fund to help young artists pursue their dreams. In establishing this non-profit fund, we are honored to be able to continue Bridget’s passion for giving. Starting on August 1 and through Elvis Week, we will hold a silent auction. Bidding will start at $500.00. You can make your bid via my contact page, text message, or Facebook message. Please send your name, phone number, your bid, and your maximum bid. Updates to the bidding will be posted periodically on Facebook during the auction time. During my exhibit at the Heartbreak Hotel on August 13-15, bids can also be made in person. 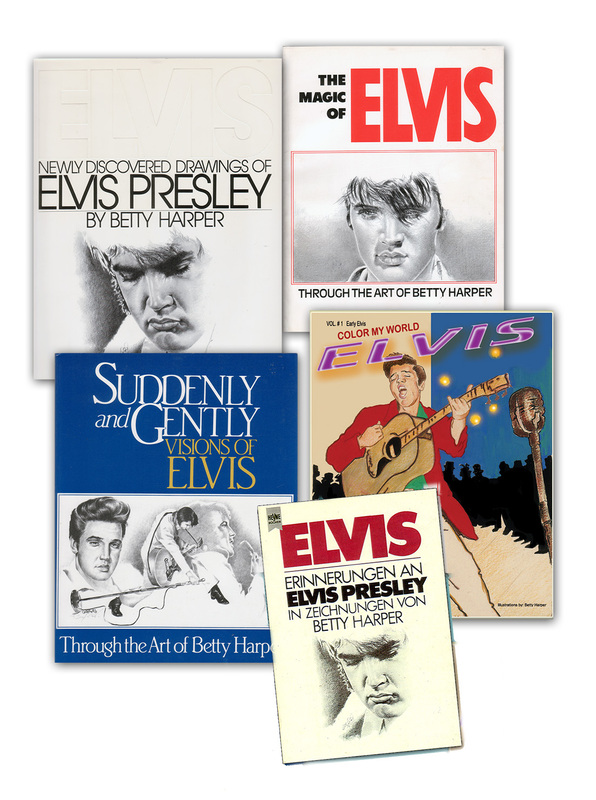 At 12:00 noon CST, Elvis time, on August 15th, the bidding will close and winner announced at 1:00 PM CST. Hi Betty you know I have been trying to get some thing personal! this would make my life dream come true. Sorry Betty though this would be a give away, guess I dont have any luck. Just saw your name after looking at Elvis Website and knew it was you. After many moves, the book you gave us in 1978, was lost. Have thought of you often. You drew pics of my Tim. Would love to talk sometimes.